When looking back on the 2015-16 season for the Maine Black Bears, there are very few positives that can be taken away. After starting the season with three ties, including one against future national champion North Dakota, the Black Bears stumbled through the season to a final record of 8-24-6, with five of those wins coming against Hockey East foes. Much like Northeastern, Maine had a tumultuous first half. The team did not record its first win until November 20 against Vermont, the first in a four-game winning streak that included a sweep of Vermont and a sweep of Princeton. The only other out-of-conference win for Maine came against Colgate on January 8. Their season ultimately came to an end with four straight losses at Matthews Arena, including back-to-back overtime losses in the Hockey East playoffs. The end of Red Gendron’s third season in Orono was met with significant turnover. Six players from the 2015-16 team will not return for the 2016-17 season. Players lost include: goaltender Sean Romeo (transferred to Ohio State); forward Brian Morgan (graduated early, will play post-grad season at UConn); forward Brady Campbell (graduated early); defenseman Dan Renouf (signed an entry-level contract with the Detroit Red Wings); and finally forwards Jack Musil and Justin Rai (both of whom will not be returning after seeing limited ice time). Renouf will be the player most sorely missed by the Black Bears next season, as he was their top defenseman both in points and time-on-ice. Brian Morgan also will be missed, as he had six goals last season, and Maine, as will be discussed soon, will be starving for offensive production next season. When looking at the players that are returning to Maine, the best word I can think of to describe them is “lackluster.” Main returns only 16 players: 8 forwards, 6 defensemen, and 2 goalies. They return just 36 goals and 115 points in total; within Hockey East play, those numbers shrink to 20 goals and 57 points. All of those returning totals are by far the lowest in Hockey East, which is bad news for a team that ranked 12th out of 12 conference teams in goals scored per game. Maine returns 5 of their top 11 scorers from last year, including its top scorer (Blaine Byron, with 24 points), but loses 4 of its top 6 scorers, including their highest scoring blue-liner (Renouf). Maine’s top returning point totals are Byron’s 24 points, Cam Brown’s 20 (with 8 goals, tied with Byron for team lead last season), Brendan Robbins’ 11, Nolan Vesey’s 11, and Eric Schurhamer’s 10. Schurhamer in particular will be a key returnee for Maine. He clocks in as the leading returning points-getter for the Black Bears defensive corps, and, quite possibly, may be looked to quarterback the Maine powerplay unit. A year ago, the Black Bears ranked 10th in the conference with a 14.1% conversion rate, although that did improve to 15.3% in Hockey East games. In net, the story isn’t much better. Maine returns two goalies who split playing time in 2015-16, senior Matt Morris and sophomore Rob McGovern. Morris played in three more games overall, and five more Hockey East games, than McGovern, but had worse overall numbers. Morris posted a .901 save percentage and a 3.54 goals against average, while McGovern sported a .905 save percentage and 2.78 goals against average. McGovern also had his “coming out party” early in the season with back-to-back stellar performances against North Dakota and Union. He saved 44 shots to preserve a 1-1 tie against the Fighting Hawks and then saved 28 of 29 Dutchmen shots to earn a 1-1 tie against Union. Both McGovern and Morris were prone to bad games, though Morris in particular struggled to find consistency. His last start of the season came in a 7-1 loss against Northeastern where he surrendered all 7 Huskies goals. For Maine to make any kind of noise this season, the play from within the crease will need to improve mightily. Reports from summer camp in Orono regarding McGovern have been positive, indicating he arrived to camp in better shape with improved mobility. I expect Gendron to turn to McGovern quickly with hopes of stabilizing his team’s defensive play. In addition to the offense and the goaltending, another major issue Maine had last season was staying out of the penalty box. Maine was second in the conference in penalty minutes per game, with 13.5, but that number spiked to 15.7 minutes per game in Hockey East play, a surge aided by a penalty-laden game versus Northeastern to end the regular season, which included 2 major penalties and 2 game misconducts. Coupled with a penalty kill that was 10th in Hockey East, along with the goaltending outlined above, and you have a recipe for disaster. The penalty kill performed better in Hockey East games (82.5% in-conference compared to 78.5% overall), but, as Northeastern fans have seen in years past, leading the league in penalty minutes is not often a recipe for success. Patrick Shea – Shea is a right-handed centerman that was selected by Florida in the 2015 NHL Draft. He makes the jump to Maine from Kimball Union Academy, a prep school now coached by former Black Bear coach Tim Whitehead. Shea racked up 26 goals and 45 assists for 71 points at KUA, and has been a point-per-game player at every level he has played at. After the KUA season he played 11 games for the Bruins Junior Selects U18 squad, where he notched 6 goals and 9 assists. Shea is expected to fasten the pace of Maine hockey on the ice, and provide a scoring punch with an edge to his game. Chase Pearson– Arguably the gem of this class, Pearson comes to Maine via the Youngstown Phantoms of the USHL. He was a 5th round pick of the Detroit Red Wings in the 2015 NHL Draft, and is considered a raw prospect that will be given time to develop while at Maine. The son of a former NHLer, Pearson scored 12 goals and tallied 38 assists for 50 points in 55 games in the USHL. He considers himself a power forward, and will be looked upon to contribute immediately with his 200-foot game. Oliver Herner– For my money the most intriguing prospect heading to Maine this season, Herner comes to the United States via the Hungarian U20 team and various leagues in his native Hungary. A towering 6’7’’ presence, Herner played at the U20 level for multiple seasons in Hungary, last season compiling a 15-36-51 stat line in 55 total games. Obviously there is not much precedent for a Hungarian player coming directly to the NCAA level, but it will be interesting to see how Herner adapts to the speed of Hockey East. A towering giant who can move the puck could be quite the find for Gendron and his staff if Herner is able to keep up with his American and Canadian peers. Patrick Holway– The final draft pick of this class, Holway was also selected by Detroit in 2015. The 6’4’’ right handed defenseman is less flashy on the blue line than Herner, totaling only 8 points and 1 goal last year over 42 games in the USHL. He did, however, put up 25 points in 28 games while playing for the Boston Advantage U18 team in 2014-15, so Maine will be hoping he can rediscover his scoring touch on the Alfond ice. Gendron is on-record as being high on Holway’s offensive skills, and we would expect Holway to potentially be given the reins to the Maine powerplay over time. Steve Mundinger– Towering over his peers at 6′ 8″, Mundinger may be the largest goalie in hockey, and hopes to remind the Black Bear faithful of the days where Ben Bishop, now with the Tampa Bay Lightning, manned their crease. Mundinger comes to Maine via the NA3EHL, a Tier III junior hockey league featuring clubs from New England and the Mid-Atlantic. Mundinger was their 2015-16 Goaltender of the Year, posting a 2.71 goals against average and .936 save percentage in 36 games. He will come in and push Morris and McGovern for playing time. Maine’s 2015-16 season was far below the expectations Black Bear fans have held for their program, and unfortunately I do not foresee 2016-17 being much friendlier. With so many lineup spots up in the air and likely being filled by freshmen, there will be a learning curve for the recruits as they get acclimated to Hockey East and NCAA speed. Coupled with the question marks in net and the persistent penalty problems, I foresee a bottom-three finish for Maine again this season. The silver lining for Maine fans, however, may be that this class has the upside to lay the foundation for future classes to build on. The exists much potential in the recruits of this Maine freshman class, and as these players grow over the next four seasons, Maine hockey could very well experience a turnaround. 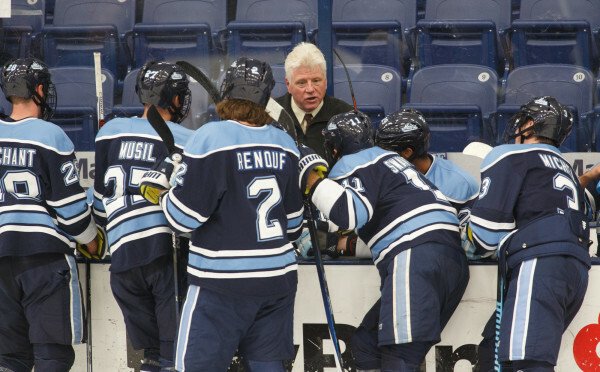 For this season, however, too many questions persist that Red Gendron will need to find answers to if his team is to find success. Follow us on Twitter @NUHockeyBlog for the most up-to-date news related to the blog and Northeastern Hockey.